Today I’ll bring you the main questline for Act 2 of the Terwilligers Event! 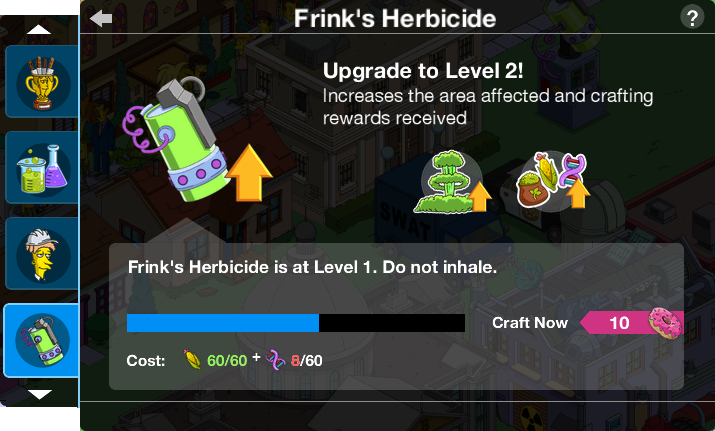 Looks like all those mutant vegetables from Part One of this event are finally gone. Yeah, but if I know anything about Part Two’s, we’re headed for a diabolical twist that will blow your socks off. 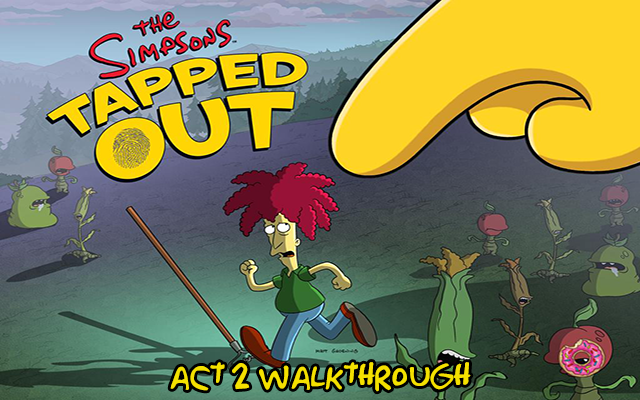 The town is full of mutant vegetables again, but now they look and sound like Sideshow Bob. We have to get rid of them! You were right Lisa. It’s slightly worse than Part One. It’s about the same but slightly worse!!! Someone has created an army of Sideshow Bob mutant vegetable clones and sent them to kill me! But who? It all comes back to Monsarno Research. I have an interview there for a summer internship, but I can promise you, the interviewers won’t be the only ones asking some tough questions! So Sideshow Bob used to be Director of Research at Monsarno? Yes, and a little of his DNA accidentally contaminated the new GMO vegetables we’re creating. A perfectly normal and predictable side effect. Like Hell! This was all Bob’s plan to kill me with these terrible clones. I don’t see how. They’re very inoffensive, and they make an excellent soup stock. I might die of how ugly they are to look at. Stupid Sideshow Bob vegetables. I’m done being scared of you. My days of hiding are done! Bart, our court-mandated father-son time begins now. My days of hiding start now! Greetings, vegetable-embattled citizens of Springfield. I am here representing Frink-Co, NOT a division of Monsarno. We’d like to be one but they refused to buy us, nnn-hoyvin. Our expert scientists, by which I mean me, have developed a potent herbicide that should nip this plague in the bud, which is exactly where it needs to be nipped. Just sprinkle this on the offending vegetable and die it shall. Afterwards, you can cook it — the herbicide is basically MSG and Mrs. Dash. For the first time, I have enough clones to join me in forming a full Cosmic Wars storm trooper platoon! Clone warriors! Our first mission is to believe that these are not the drobots we are looking for. 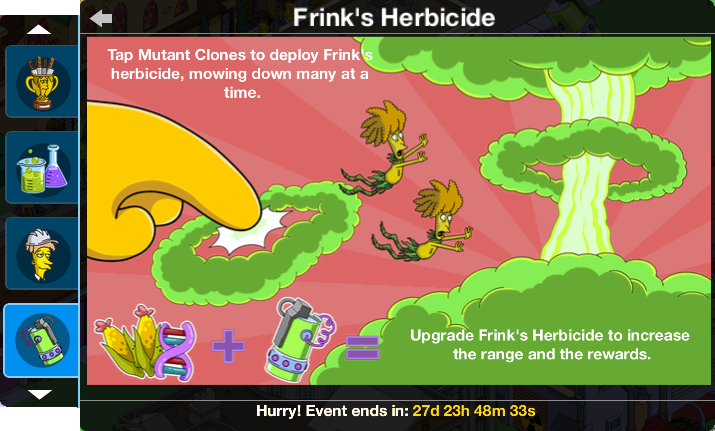 Professor Frink, you’ve got to kill these Bob-clones faster! Everywhere I turn, I see them. I’m going crazy. Who knows what kind of pranking I could be driven to do?! Dear God. We’re already known as America’s Doorstep-Burning-Poop-Bag Capital as it is. Do something, Frink! Fear not. Frink-Co shall live up to our slogan: “The Science of Slaughter”. It’s not a great slogan but it was the only one no one else had taken. Ms. Krabappel, where are you going with that vegetable Sideshow Bob Clone? These clones are real gentlemen. They’re well-groomed, they don’t gas on about themselves, and they always have something nice to say to a lady. Plus if you kiss them you get vitamin C.
Oh no you clones don’t — dating our ladies. I’ve got enough competition for women from real human men. Although to be fair most women would rather clean sewer traps than go on a date with me. It’s time to squash Sideshow-Bob-shaped squash! Damn it, the men of Springfield are squashing our handsome vegetable hunks. Cecil, you better get more clones out on the streets or you’re going to get handbagged hard upside the head. But that would violate every inch of scientific ethics. The alternative is I violate several inches of you. The single men of Springfield have formed a mob that wants to destroy all the Sideshow Bob clones. And the single women have formed a mob that wants to create more of them. Whichever mob destroys more property is the winner. How do you propose to rectify this PR nightmare? Well, the Corporation could do something to dramatically improve the cultural life of Springfield. Donating some used magazines would do that. I had in mind building an Opera House. It sounds like an expensive boondoggle. A boon of which you will receive an ample share of doggle. We break ground in five minutes! Whenever Monsarno runs into trouble, they build an opera house. Once again, my brother Cecil is my unwitting dupe. It was but a tiny effort to put some of my DNA into those vegetables, just as I added some Booberella DNA into these lusty leafy vegetables. Hush, my sweet. There will be time for pillow talk… tonight. Finally, after more then 3 years, Sideshow Bob is ours! This is all for now, join us next time for more info on this update. Happy tapping! last week, i finished Act2 when the event was ending. the Opera Stage appeared, but i didnt get a Sideshow Bob. what do i do? Appeared? Did you actually place it? yes. 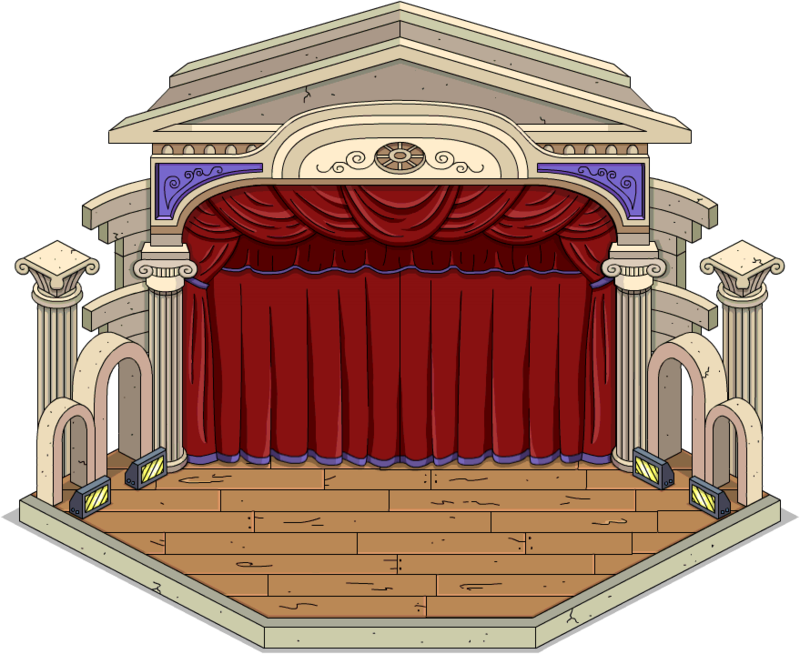 i placed the Opera Stage, but no Side Show Bob. There is still time left. Maybe you’ll be able to get Mrs K. This is such a fail from EA requiering a character that unlocks at a high level for an event! Events should be for everyone, no matter what level, it was hard enough to get Bart during Christmas event. Maybe the requirements will change so you can progress without Edna but I wouldnt count on it 😦 This makes me sad. XBL-Heretic on EA forum wrote: In America, roughly one in 99 people are incarcerated I n the prison system, the highest of any country in the world. In our SF, iirc at least six of 140-ish total characters have prison Serving Time tasks, resulting in one in 23 under Mayor Quimby’s tutelage. So SF’s incarceration rate is roughly four times higher than Americas rate. It would seem that we do indeed need another prison in SF. What do the rakes do? Is it still optimal to continue to upgrade Monsarno instead of trying to gain the Farmers Market? Last job unlocks at 16 and payout increse on 17-19, actually the increase continues at 20+ but then it os not worth it IMO so either stop at 16 or 19. First time anything like this has happened for me. I’ve placed the rakes. Makes me happy! Yay!!! Thanks for the heads up, and all the other super fresh info that you share. You are the shiz!!! Um I don’t know if this is a glitch or not, but I stoped getting the red box tasks to earn more prize currency. Was that ment to happen?